The aroma of Indian Spices reached to all the food lovers and spice traders across the world since ancient age. It is entirely true that anyone can take an Indian out of India, but nobody can take India out of an Indian – this saying is true to some extent, as the Indian food has a direct connection to all Indian’s heart through the stomach. The USP of Indian food greatly depends on different types of spices which certainly have some great health benefit, as well as they, makes the food even tastier and luscious. The Spices used in daily Indian cuisines also give the different food colour, not only that some spices also acts as a medicine in some cases. If we add slices of ginger in tea, it’s not only a morning beverage then; it acts as an excellent medicine in common cold. The main region of India famous for growing spices is the Malabar, which is in the Western part of Southern India. It is famous as the Spice Kingdom. Foreign traders from the different region came to explore Indian spices for trading. Asian people started spice trade since ancient age. So Indian spices have ensured a significant part in the Indian economy as well, as it helps in earning foreign currency through export, as there is a huge demand for Indian spices outside India. In ancient time spices were as precious as gold and acted and used as medicine. Nowadays as online shopping is a trend, as everybody wants to avoid going to grocery shop, comparing the price rate and chose the brand after engaging lots of time. So people of this generation prefer to buy Indian spices and seasoning herbs online. Buying Indian Spices Online is a natural and easy process as the internet and satellite connection has made global market accessible to everyone. Anyone can order spices online in India and get the delivery at home paying low shipping charges. As far as quality and price are the concern, buying spices online form KiranaPlace ensure the high quality at reasonable price, as the buyer can compare the prices from different sites available for online spice shopping. There is the variety of Indian spices. Most typical Indian Spices That are used in almost every region are Turmeric, Black Cardamom, Dried raw Mango Slices, Cumin Seeds, Coriander Seeds, Red Mirchi, Cloves, Cinnamon, Mustard Seeds, Fenugreek Seeds, Bay Leaves, Saffron. Cardamom: Generally Two Types of cardamom available here in India—Green(Chhoti Elaichi) and Black (BADI ELAICHI). Green cardamom used commonly in Indian dessert to Lassie and tea to add extra flavour. Green Cardamom is mixed with other spices like to make Garam Masala, used in non- veg and some typical vegan cuisine to enhance fragrance. Only the Pods inside are used. BLACK ELACHI is mainly famous for its flavour. It is very strong spice. Only the black seeds are used. Both the cardamom seeds are used as after meal mouth freshener, and a good appetiser. Cardamoms are very much helpful in heartburn, gas problem and to solve the digestive problem. Turmeric or Haldi: Very common and essential In Indian Kitchen. It enhances the colour of any kind of food. Turmeric itself has an excellent antibiotic agent, and it has numerous health benefits. It cures any problem in the stomach, very well for skin care. Turmeric can solve the ringworm problem especially in the case of kids. Also give relief in muscle pain. Cumin Seeds or Jeera: Most Common Indian Spice. It used as a whole or grind to form a paste to add flavour in different types of curry. Helps to digest food if utilised in a minimum quantity in daily cooking. Cloves(Laung / Lavang): Clove is the tiny bud-like spice used as a spice as well as medicine. Clove oil is excellent for any tooth problem. Essential ingredients in toothpaste. Dried raw Mango Slices OR Amchur: Made from raw green mango. Used very commonly all over India, for seasoning and to add some extra sour taste to some dishes. 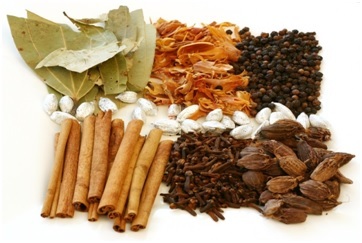 Cinnamon Bark (Dalchini, Kalmi Taj): It is the bark of the plant that is used as a spice. It adds a very nice flavour to any dishes. Helps to digest the food by boosting up the enzyme secretion. Recent research shows its power to fight against type 2 Diabetes. Indian Spices are the symbol of unity in diversity. Apart from adding flavour and colour, all the spices have numerous health benefits. They can be used as beauty care products too. But be careful before use them as medicine, as they some of them are not meant to take raw. We should use the Spices to make our daily diet even healthier.